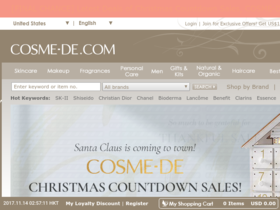 Act now to enjoy up to $10 Holiday cash free from Cosme-De online. Use this coupon code online at Cosme-De to save 18% off your order of $200+. Shop for skincare and makeup at Cosme-De to save up to 80% off retail. Shop at Cosme-De.com and enjoy free delivery on orders of $40+. Check out Cosme-De online for their latest daily offers. Save even more with exclusive email offers from Cosme-De.